Thank you for your interest in our work. 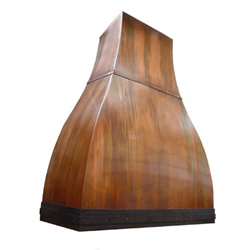 Due to the wide range of custom work we do, we do not have general pricing to send out for range hoods or lighting. Any of our designs can be done as a wall or island mount. Also, customization of size, shape, finish, material, or design in general is possible as we make each hood to order. The overall size of your hood will be determined by the size or your range and the height of your ceiling. The bottom edge of the hood should be 30"-36" from the top of your range and the width should be at least the width or your range plus, ideally, 2"-6" on either side. You are requesting a quote for Range Hood #24, B. * Select Hood Cooktop Width in. * Select Hood Ceiling Height in. I'm not sure - I'll need you to consult with me about my particular project and which fan might work best for me. No thanks - I have my own liner/insert & fan. I will send it to you to incorporate it into my hood.